This might be the greatest thing I've ever seen! I mean, we've seen it done in cartoons and The Little Rascals, but I have never seen this done in real life and it is awesome! Not to mention, fully documented on video! So, two jokesters recently squeezed into one pair of pants to sneak into a movie theater as a single person with one ticket. In the Little Rascals, they would sit on each other's shoulders under a long overcoat to create a tall man. It's the same idea, but that was a TV show. How could this even be possible. Well, best buds, Bo and Matthew filmed themselves carrying out their elaborate transformation in a YouTube video that documented their hilarious "waistgate" scheme. The video showed a couple of failed attempts at putting the larger man together. One of the two men manages to cling to the other's chest, wrapping his legs around his buddy's waist. 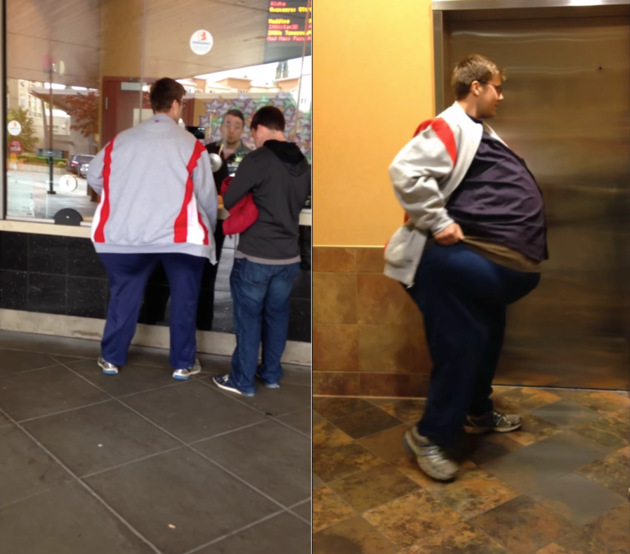 A large shirt and track jacket were then placed over the two men, creating this giant bulge resembling a massive belly. Once they mastered the look, it was time for them to practice their walk and talk before heading to the theater. The video showed the face of the operation practicing, "We'd like one ticket for The Avengers, please." A voice on the other side of the camera asked, "What do you mean, 'We'?" Good point! The guys' clever getup fooled the theater's staff and earned them a spot on Reddit's front page this past Monday. Their video has since been viewed more than 17,000 times. The place of the action and the names of the culprits are unknown, which makes this feat even more brilliant than you know, but these guys get an A+ in my book for creativity! This was awesome. My writing does this no justice. You need to see this for yourself!